Hey guys! Regent is the first map that I've managed to finish in about three years, but I think I understand the new economy enough to make a balanced map. Anyway, this map is rather linear and has a more fixed expansion layout, where the low ground third is your intended third, however you could take the base in front of your main as a third. Controlling the center is important in order to protect the bases near the center in the mid and late game. There are two watchtowers on the low ground hugging the center that keep an eye on the fastest path, the low ground rocks, and give sight up the ramp. Line-of-sight blockers on the low ground can obscure army movement, and the two pairs of destructible rocks restrict movement until they are destroyed. Destroying the rocks on the high ground outside of the natural does not significantly affect the rush distance from nat-to-nat, surprisingly (the difference is 1 second or less as far as I can tell from timing it). It's pretty decent. I think that it is overly connected though (in true LotV fashion ). Once the rocks are down you can essentially walk in a straight line from any point on the map to any other point which doesn't make the terrain too meaningful. It was less connected in previous versions. There used to be more rocks blocking off the center lane from the center bases, but that ended up being too restrictive, so I removed them. Honestly I like all the pathways that are present in the LOTV maps, I think they make for better gameplay now that deathball armies are not as much of a thing anymore. When they were, more restrictive pathways made more sense imo. I can't really agree with that. Maps being too connected mean that army placement is no longer as important. More rocks wouldn't be better here because the level of connectedness if fine when the rocks are up, but once the rocks are down every path's a straight line. 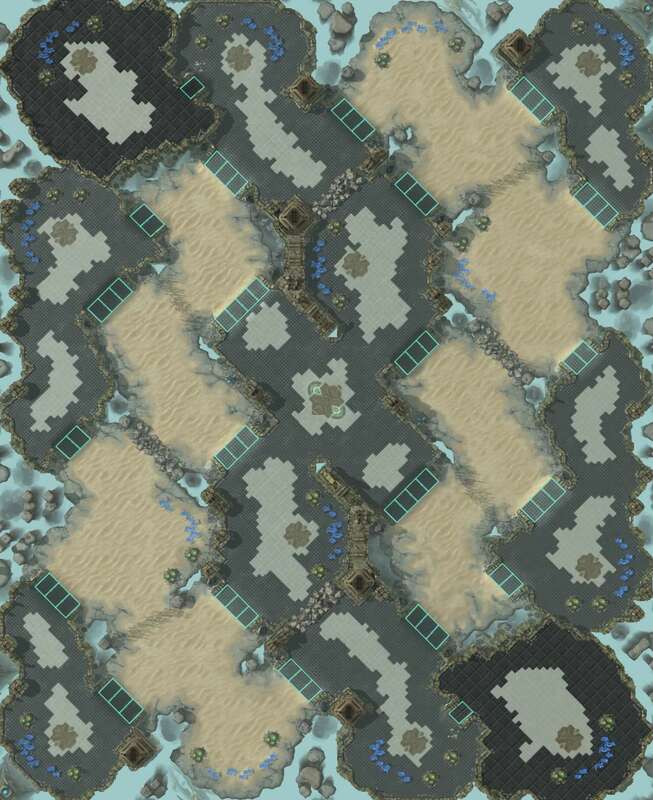 Yea the rock setup is fine imo, maybe try to find a ramp you can remove and reform the terrain around it that makes pathing/engagements more interesting/strategic. Not sure which one though.